Screen Research’s comprehensive portfolio of motorized drop down screens offers a wide range of high performance options and features whatever the budget. Classic screens offer on-ceiling and in-ceiling slot opening options with Screen Research’s Standard tab-tensioning system and integrated infrared remote control. 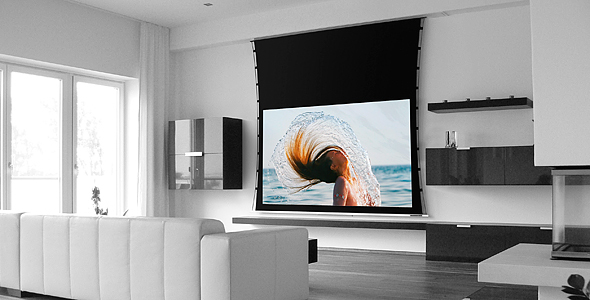 Supreme screens offer a wider range of mounting options including in-ceiling trap door opening and a full range of masking options catering for virtually any popular video projection image ratio. Supreme screens feature Screen Research's patented TFX Floating tab-tensioning system. A dual floating weight design ensures that the screen is flat and wave-free in use. Supreme screens permit the use of more rigid fabrics, in larger sizes, and with the option of longer custom drop combinations.